Atwood Magazine is excited to share our Editor’s Picks column, written and curated by Editor-in-Chief Mitch Mosk. Every week, Mitch will share a collection of songs, albums, and artists who have caught his ears, eyes, and heart. There is so much incredible music out there just waiting to be heard, and all it takes from us is an open mind and a willingness to listen. Through our Editor’s Picks, we hope to shine a light on our own music discoveries and showcase a diverse array of new and recent releases. This week’s Editor’s Picks features Far Caspian, Baker Grace, Ruthie, BETWEEN FRIENDS, Daisy the Great, and SUSTO! Far Caspian were one of my favorite discoveries of 2018, having whisked us into the clouds with November’s debut EP Between Days – a thing of striking resonance and beauty that “marries nostalgia and disconnect in a stirring display of vulnerability.” A few months later, the Joel Johnston-led Leeds trio have returned with high spirits and an air of excitement. “Conversations,” officially released February 5th, 2019, is a glistening drop of dream pop bliss. The song opens with percussive sounds reminiscent of a metronome, and it’s not long before the band bathe our ears in those characteristic hazy, effected guitars. The melancholy wash of their introductory songs is notably absent this time around, having been replaced with a cheerier sonic disposition radiating hope and possibility. Indeed, Far Caspian sound more like Lord Huron and Real Estate, and less like Day Wave and ISLAND than ever before – though that’s not to say “Conversations” is any less nuanced or introspective than their previous material. Joel Johnston’s lyrics explore identity, individuality, escape and self-discovery in the context of interpersonal relationships and interactions. He asks philosophically dense questions about who we should be, and why we do what we do. He’s observing behaviors of his fellow twenty-somethings and wondering aloud, what is it all for? For such rhetoric as this, there is no definitive answer – yet it’s no doubt a conversation starter. If Between Days presented themes of solitude and loneliness through dark clouds and a thick haze, then “Conversations” represents the sun shining through and melting the fog away with its bright, warm rays. Far Caspian are coming into their own to show they can dwell as much in the darkness as they can in the light, and we listeners are the real winners. Upbeat and energizing, “Conversations” is an exciting joyride that elates, provokes, and inspires. Eighteen-year-old Baker Grace has come into her own on “Wrong Kind of People,” her sweet 2019 reintroduction full of reflection and resolve. A pop artist with breakout potential, Grace (real name Chloe Baker) has been making waves for quite a few years now. I remember first discovering her music back in 2014, when she, as a younger teenager, sang under the name Bitter’s Kiss and recorded out of her father’s recording studio. Baker’s eight-track Bitter’s Kiss album was an exemplary display of raw talent, to the point where one of the world’s biggest record labels, Republic Records, took notice. I can only hope that Chloe Baker maintains her integrity, and that she doesn’t lose herself to the money-hungry industry that is so notorious for chewing young artists up, exploiting their talents, and spitting them out. Don’t make music for the #1s, Baker — be like Broods and make from your heart! Truth be told, it seems like the Weehauken native has already learned this all-important lesson. “I was looking for the wrong kind of people to show me the way,” Baker Grace sings in her intimate new single. “Always searching for somebody to tell me I’m doing okay. Getting wasted on the hype of the ego, think it’s time to take care of me.” Released February 4th, “Wrong Kind of People” is home to some of the wisest words I’ve heard all year. Baker Grace sings with confidence and self-knowing as she reflects on previous moments of loss and self-doubt – of following the wrong path, and looking up to the wrong people. Her smooth croons and cries project powerful emotions, while underneath her swims an indulgent melange of synths, keys, and cool percussive hits. It’s a powerful pop song imploring each listener to follow your path and no one else’s. There’s no such thing as “faking it ’til you make it” — thus, Baker Grace has resolved to be her authentic self, and let her truths shine. Once upon a time, Chloe Baker was just singing her songs at home in New Jersey; she’s quickly becoming a commodity, and the overwhelming weight rests squarely on her shoulders. The ensuing video, set around a photo shoot (what a perfect backdrop to capture vanity! ), highlights not only the industry’s manipulative tendencies, but also their negative impact on young, impressionable men and women. “Wish that I could trust my own eyes; shouldn’t need someone to tell me I’m alright,” Grace sings in the song’s very first stanza. This is a hit in the making. I don’t think it will be long before the <1,000 listeners visual on Spotify is replaced by numbers in the hundreds of thousands, and truth be told I’m excited to have rediscovered Chloe Baker aka Baker Grace before she fully took off. “Wrong Kind of People” is fresh and intimately emotive: The kind of honest outpouring that can, and hopefully will have seismic ripple effects. 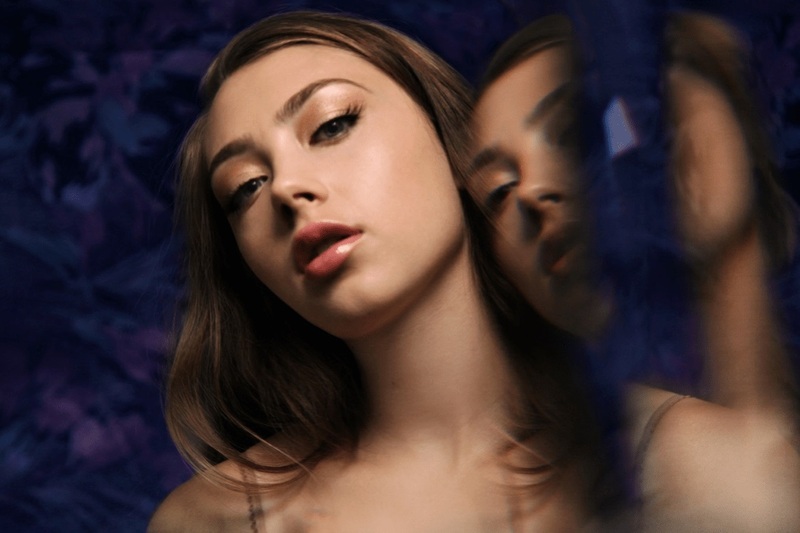 Familiarize yourself with Baker Grace now, and stay tuned for more as she prepares to release her new persona’s debut EP Girl, I Know (out later this year via Republic Records)! Brooklyn’s Daisy the Great released their debut album I’m Not Getting Any Taller in mid-January, and I owe Spotify’s Discover Weekly playlist full credit for putting them on my radar this week! Like The Staves and fellow Brooklynites Overcoats before them, Daisy the Great are giving folk pop a breath of fresh air. Led by Kelley Nicole Dugan and Mina Walker, alongside Matt Lau, Bernardo Ochoa, Matti Dunietz and Briana Archer, Daisy the Great dazzle with rich two- and three-part harmonies set against invigorating folk and rock instrumentations. What’s wonderful about Daisy the Great’s approach is that they adhere to no single sound and style. There are times on I’m Not Getting Any Taller where the music harkens back to the uptempo bounce of ’60s girl groups, but these are contrasted by the pop/rocker “Last Kisses” and again by bittersweet folk indulgences like “Famous.” My personal favorite continues to be “Dips,” an intimately poetic, slower folk song with a heartwarming message of longing and love. How many bands inject such intelligent lyrics into such frollicking melodies? Who knew folk would be so alive and thriving in 2019?! Daisy the Great’s debut album is an expansive, lively indulgence of harmony. There’s something new around every corner of I’m Not Getting Any Taller, and for those fans of the sweet folk persuasion, Daisy the Great are definitely a new it band. The ex-frontwoman of Leeds band Bruising, 23-year-old Naomi Baguley is re-emerging in 2019 as pop/rock songstress Ruthie. Her debut single “What Kind of Woman” is a beautiful, classic rock-esque rumination on love and loss. “What kind of woman would I be, if you said these things to me?” she wonders in the entrance, singing atop a sweet mix of bright piano and lilting guitar. The scene is thus set for a moving, psych-tinged journey that takes both from Brit pop, as well as more traditional songwriter balladry. If you’ve been through a breakup, then this song speaks to you. If you’ve had to start over, then this song speaks to you. Musically bright and deeply vulnerable, “What Kind of Woman” makes for one memorable debut. BETWEEN FRIENDS’ sound is akin to that of their Californian peer NoMBe, but it’s distinctive and unique all the same both in sound and in structure. They manipulate guitars to become larger-than-life vessels of intoxicating sound, and the Hudsons’ vocals fill in the rest through lush harmonies and their inherent dreamy warmth. I hear “affection” as an external search for validation that can only come from within, and I absolutely love how it twists the purpose of a relationship to be something some looks to for something, rather than a partnership or source camaraderie, support, etc. It’s a recognition of how we are can all mishandle those who are closest to us; a very intimate apology, if you will. BETWEEN FRIENDS are poised for a big year, and with “affection” they have already started off on a very high note. This is music to soak your soul in; theirs is a safe space to lose ourselves, let go, and float along with ease. The lead-up to SUSTO‘s upcoming third album Ever Since I Lost My Mind (out 2/22 via Rounder Records) has been rife with catchy melodies and writhing indie rock energy. The Charleston indie rock band feels fresher than ever on songs like “Homeboy” and the recently-released “Weather Balloons,” each of which captures frontman Justin Osborne’s hearty, raw vocal rasp in very different ways. Now’s as good a time as ever to discover and embrace the passion this band brings to each of their songs. Additional credit goes to producer Ian Fitchuk, who seems to have captured the lifeblood of every instrument playing on Ever Since I Lost My Mind. SUSTO’s songs are dynamic, cathartic, and incredibly in-your-face; their music is leaving the kind of unforgettable mark that keeps me coming back for more. I’m counting down the days until February 22, when the world will finally hear this new album in its entirety. For now, songs like “Homeboy” and “Weather Balloons” are keeping me fired up and ready to go.